I'm just loving the Herringbone Technique from the December TJNL - such a great way to use up all those extra scrap pieces of Pattern Paper. Don't forget, tomorrow the TJNL Design Team will be having our Monthly Blog Hop, be sure to check back tomorrow and grab your clue for this months Fantastic Prize! To create my card, I used Stampin' Up! 's Merry Moments DSP for my Herringbone, cutting my strips at 1/2". I stamped the image from Holiday Lineup in Black Archival on Watercolor Paper, then colored using the Marker Watercolor Technique. Those little guys just look outstanding on that beautiful bg! 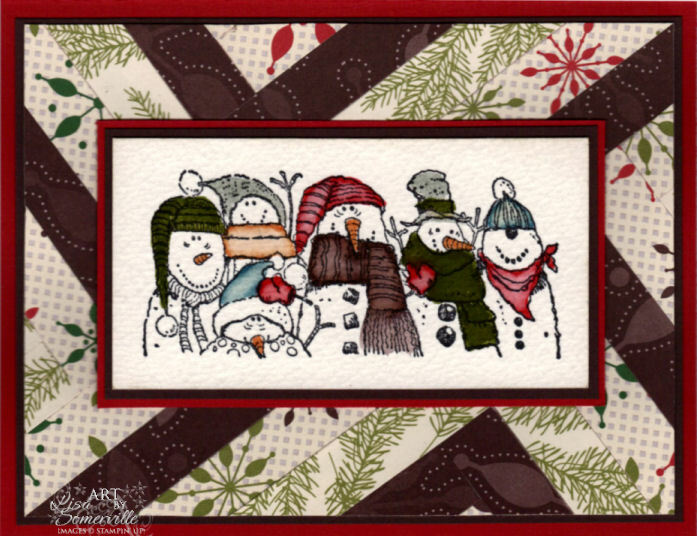 I am not a quilter- but used to sew quite a bit- there are so many great ideas for cards with quilted BG's- your card is awesome! I love this bg, I just my TJ newsletter and saw this. Really cool!! Very neat card! Love that image.